Although I returned to work last week, it was only 2 and a half days and didn't really feel like the festive season was over, so today it really is back to business. Trying to get all the little jobs done the night before because there will be no time during the week to get them done now we are back to normal. Just like that the holidays are forgotten about and we get back to the grind as if there was never any break to begin with. I do love my routine though, not necessarily the time constraints that come with it but the order being back in the house. Looking at the above it would seem preparation is the key to make all the juggling go as smoothly as possible and Day 1 back it, we are doing good, y'know that's a good effort right there. Now just to keep it up for the foreseeable, we should do, I mean if we stick to our "getting up earlier so we aren't rushing" philosophy that we've been attempting for the last god knows how long....we'll be just fine! All back to normal now! The boys were delighted to see each other in school today - feels weird not having him around the house for the morning. Regarding your childcare, you know you're always welcome to avail of a playdate :) Happy working week! Glad the first day went smoothly. If only my teen could subscribe to "getting up earlier" then my mornings would be much less stressful. 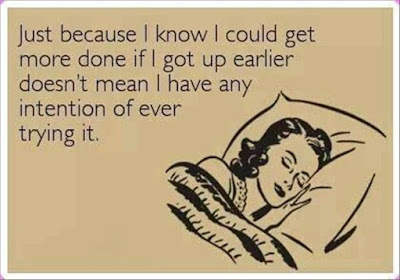 I failed at the getting up earlier yesterday and today! !